During the latter 50 years of the Han Dynasty (206 BC–220 AD), political corruption, schismatic warlords, and violent rebellions ran rife. Wealthy families who had been forced to help the Emperor suppress the revolts secretly decided not to disband their military forces, and instead began amassing power outside of imperial authority. 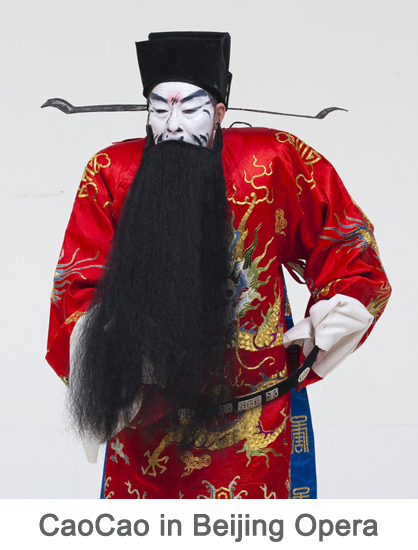 This set the scene for a sequence of epic clashes that would become legendary in Chinese history and would lead to the fractured Three Kingdoms Period. In the ensuing chaos, three formidable warlords emerged: Cao Cao, an imposing military general and Chancellor of the Han Dynasty; Liu Bei, a descendant of the imperial Liu family who was born into poverty but rose to prominence thanks to sponsorship; and Sun Quan, the son of a Han Dynasty general. Cao Cao was an excellent strategist and managed to gain control of northern China, but was foiled in his attempts to expand his territory during the Battle of the Red Cliffs in 208 AD, when Liu Bei and Sun Quan formed an alliance to defeat him. 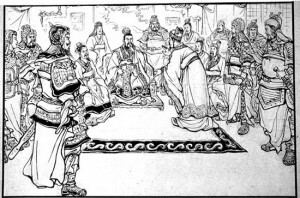 Nonetheless, Cao Cao maintained his stranglehold on northern China and was promoted to the status of vassal king in 216, earning the title “King of Wei”. 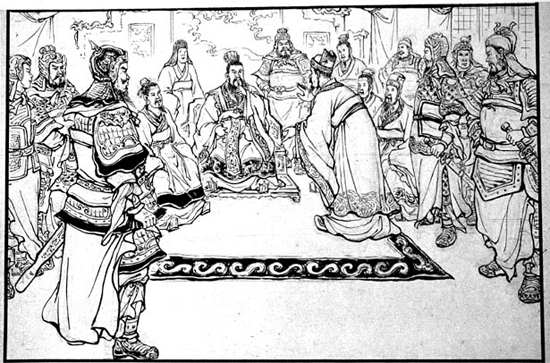 Yet, while Cao Cao just couldn’t wait to be king, it seemed that his son had his eyes on a much bigger prize! When Cao Cao died in 220, his son Cao Pi took his place and, in the very same year, forced the reigning Emperor Xian (r. 189–220) to abdicate. He swiftly declared himself Emperor and founded the Kingdom of Wei (220-265). Talk about burning ambition! However, Cao Cao’s failure to unite the kingdoms of the Chinese empire meant that large parts of China were left ungoverned. 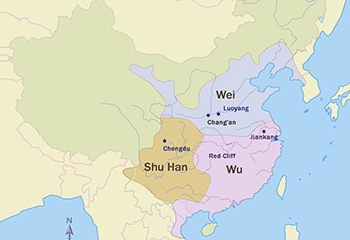 In 221, Liu Bei took control of a south-westerly region known as Shu, which covers much of modern-day Sichuan province, and established the Kingdom of Shu-Han (221–263). Similarly, Sun Quan conquered much of China’s south-eastern territory and founded the Kingdom of Wu (222–280). In this way, the Han Dynasty officially ended and the country was left fissured, in a state historians now refer to as the Three Kingdoms Period. Although the Kingdomd of Wei was politically the strongest and controlled the most territory, it was constantly vying for dominance with the other two kingdoms. Military campaigns during this period were of such importance that, alongside the rulers of the three warring dynasties, great strategists such as Zhuge Liang and Lu Xun would emerge and achieve an almost mythical status in the Chinese canon. Whether it was Liu Bei trying to take back the province of Jingzhou from the Kingdom of Wu, Cao Pi attempting to extend his territory further south, or the shocking overthrow of the Wei Dynasty by the Sun Family, this period in history was marked by vicious and tactical warfare. In fact, the country was so marred by violence that its population dropped from a healthy 56 million during the Han Dynasty to a staggering 16 million by the time the Jin Dynasty (265-420) reunified the country in 280. If the historical records are accurate, this would make the Three Kingdoms Period the second deadliest era of warfare in world history, rivalled only by the Second World War! That being said, these historical censuses only account for the living population at the time and don’t give specifics about the death toll. Though warfare was undoubtedly the predominant cause, the famine and disease that resulted from the destabilisation of the government were certainly contributing factors. Regardless of how it happened, it would take until the Sui Dynasty (581-618) for the population to finally recover from such hardship. The Three Kingdoms Period was so etched into the minds of the people that it spawned several great works of literature. After all, tragedy is one of the most popular literary genres! The most notable of these are a historical text known as Records of the Three Kingdoms by Chen Shou of the Three Kingdoms Period and the classical novel Romance of the Three Kingdoms by Luo Guanzhong of the Ming Dynasty (1368-1644). Guanzhong drew heavily from Shou’s historical account but largely romanticised and dramatized the affairs of the past, turning historic events into the stuff of legends. His work is now acclaimed as one of the Four Great Classical Novels of Chinese Literature and has resulted in the Three Kingdoms Period becoming one of the most well-known epochs in Chinese history, in spite of the fact that it was also one of the shortest. Since then, it has been immortalised in opera, film, television, and even went on to inspire a popular video game series known as Dynasty Warriors. Evidently it is true what they say: live fast and die young! And, just as it had started, this historical era went out with a bang! From 263 to 264, the Wei Dynasty launched a series of military campaigns that were finally successful in conquering the Shu-Han Dynasty. Yet with great power comes the possibility of even greater betrayals! The Sima Family had long been a substantial influence on the Wei Dynasty but, in 265, a Wei general named Sima Yan decided to usurp the throne and establish the Jin Dynasty. In 280, he was finally able to overcome the Kingdom of Wu and thus reunited the country. For a few years, at least!